You can find our booking office right in the centre of Killarney town at the market cross on main street. Pop in and we can give you information about the tour. See our timetable. 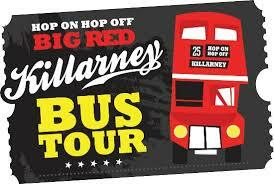 Its easy, book with us or HOP ON at any of our bus stops. See Killarney at your leisure, our service starts at 10.00 each day, leaving from our stop on the EAST AVENUE ROAD in the centre of town seven days a week. We will take you through the town, highlighting all the local historical landmarks, birth places of some of our famous sons and characters (allowing time for photographs) we then proceed our stop at AGHADOE where you can HOP OFF (historic 13th century tower, church and a majestic panoramic view of the lakes and he mountains), then its off to ROSS CASTLE on the lakeshore (15th century castle) he there are beautiful walks, boat and jaunting car trips, we then head to MUCKROSS HOUSE & GARDENS (18th century home to the Herbert family, with its sprawling grounds and winding trails, restaurant, museum, cafe etc) then onto TORC WATERFALL, a most beautiful view can be had from the top of the steps that wind up the mountainside next to the falls. From any of our stops you can HOP OFF and easily spend two and half hours exploring or relaxing until the bus comes along again or just stay on and enjoy the tour. If you cant fit it all into one day, your tickets are valid for two days. Our tour is designed to make the Killarney experience your own. A free map and history guide are available along with live guided commentary onboard from our driver/guide.